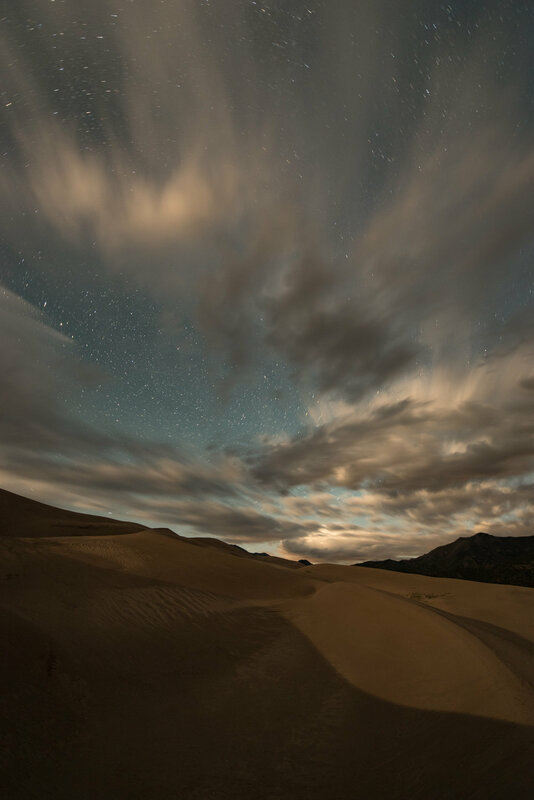 Colorado's unique geological wonder features the tallest sand dunes in North America and is a diverse ecological wonderland—ideal for capturing the Perseid meteor shower. This was a 4-night and 5-day workshop. The adventure began on August 10 at 10 a.m., and ended on August 14 in the afternoon after the group slideshow. Note: Deposit of $300 required to reserve your spot at the workshop. Balance of $1,100 due on or before June 11, 2017. Or, you may choose the "Pay in full" ticket if you desire to pay all at once. As with all National Parks at Night photo workshops, we will teach at this location only once. If you have a dream of making epic long exposures at night in this location, we hope you join us. During your workshop, you'll get five afternoons that include some lecture, daytime field instruction and image critique. Also included are four nights of shooting under the stars. Our workshop starts a couple of days after a full moon, which means we’ll have a great blend of crisp moonlight and dark skies—more of the latter as we move deeper into the workshop. It's high desert at altitude, so keep in mind the air is thinner (less oxygen) than you're accustomed to if you normally live at sea level. 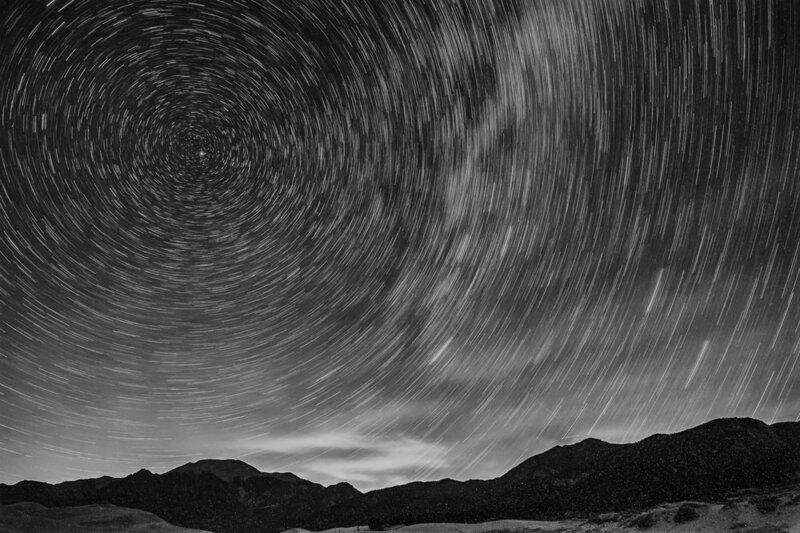 We'll start with panoramic astrolandscape photography, photographing star trails and the Milky Way at Great Sand Dunes, then learn how to photograph and process images during a meteor shower. 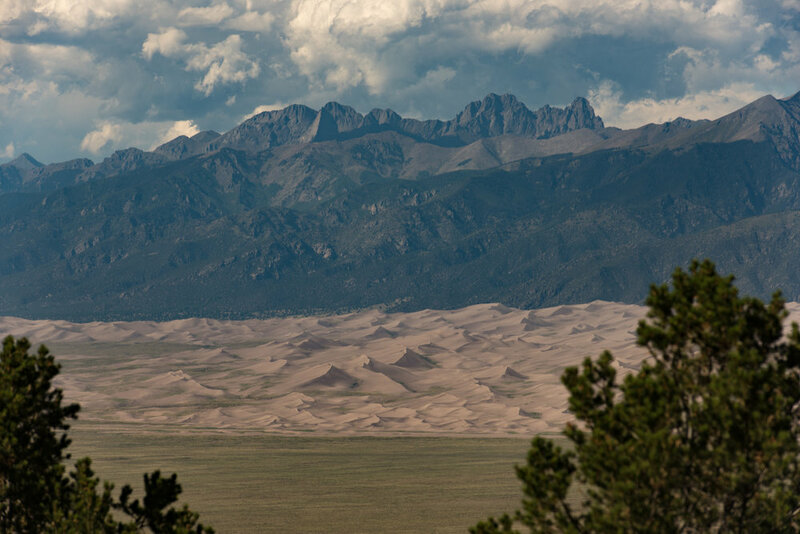 We'll also explore the high desert valley north of Great Sand Dunes, some small towns and the mountainsides overlooking the valley. As our friend Tyler Nordgren says, "Half the Park is After Dark." See his amazing Great Sand Dunes poster here. The workshop base camp will be in nearby Alamosa, Colorado. We are amidst negotiations to secure a block of standard rooms. Details to come shortly. There are options for other hotels and camping within the park if you prefer, but all instruction and critique will be held at the host hotel and being on time to those is much easier if you are staying there, especially given the late hours we will keep. We encourage eating two meals per day—a good breakfast and a great late lunch. When on the night shoots, you may wish to bring snack food or a sandwich and PLENTY OF WATER. You are responsible for your own airfare and car rental. If you are interested in sharing a car rental, let us know and we will try to connect you with someone like-minded in the group. Matt's tip: I usually fly to Denver International Airport, as there are more flights to/from there at better prices. You should be comfortable with the manual-exposure operation of your camera. You must also consider that hiking on sand in higher altitudes is part of this workshop—please consider your physical abilities prior to registering. If you have questions, please contact us—we're happy to talk it over with you. Be advised the hotel is 40 minutes away from the park—lodging with meeting space is scarce in the area. I was spending a month in Denver to work on the inception of my fine art project, Night Paper, and took a mental break to explore Colorado. I took a solo camping trip down to Great Sand Dunes with a ton of photo gear during a new moon. And I left breathless. After the four-hour drive from Denver, I checked into my campsite and sat resting on a picnic bench, looking west toward the dunes from the campground. The late-day sun kissed the dunes. A thunderstorm rolled in over the valley. With skies so huge, you could see the edges of the storm and the gray, misty area beneath as it crawled across the valley toward us. I felt no concern—only awe. It was so beautiful I could only observe and enjoy it. And magically, as the storm hit the dunes and the mountain range they nestle against, it broke up and a double rainbow glowed behind us. Pretty epic introduction to the park, eh? I thought so. I slept for a few hours to gather my strength. I awoke as dusk was departing, packed my three cameras and proceeded to the riverbed. I struggled with the photography experience, as you can read here. But what a magnificent place to struggle. I've gone back a few more times. Why do I come back again and again? I've yet found no other outdoors space like it. Sand and hardy vegetation. Desert and mountains. Water and stone. 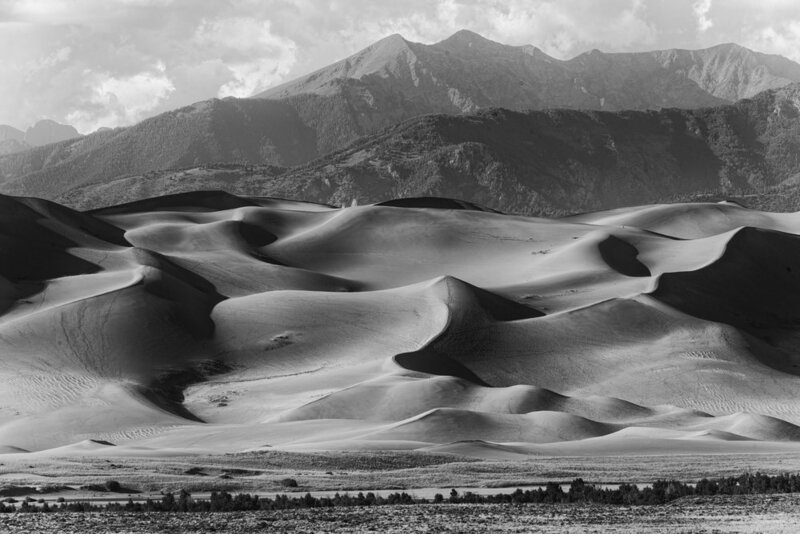 Great Sand Dunes is the nexus of many things that usually don't exist in juxtaposition with each other. And dominating this is a field of giant sand dunes - always there but ever-changing. 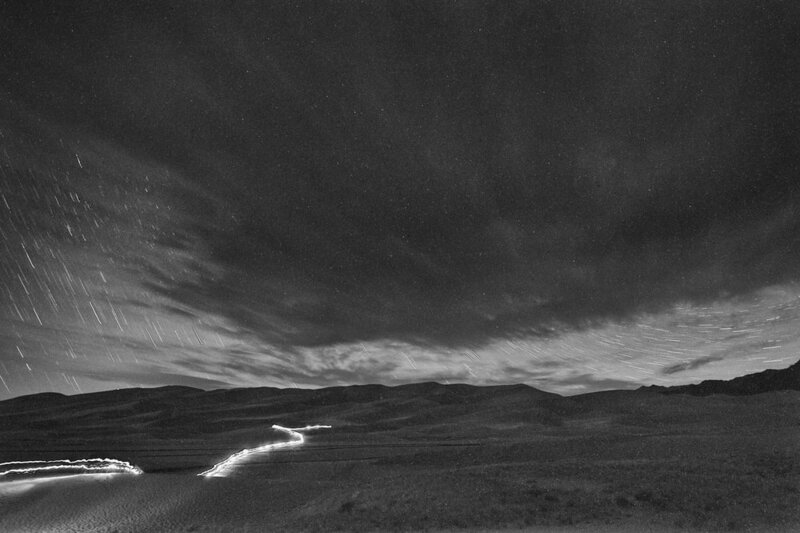 I'm looking forward to coming back again to learn more of the Dunes' night-time secrets. classroom 2:00-5:00 - - - Image prep and final slideshow. Optional informal shooting in the evening.